The harp is a nice addition to many special events. Adrienne has experience playing for many different occasions. She has played at functions for as few as four people to as many as several hundred. 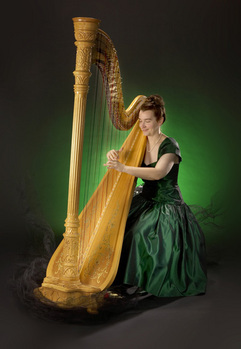 Her harp music will provide a nice touch to entertain your customers or guests. It will bring a relaxing ambience to your special event whether it is casual or a more formal event. The nature of harp music is such that it can be enjoyed by your guests and provide entertainment and background music without being overbearing, allowing guests of talk and mingle. Because the harp is a stand-alone instrument and portable it is well suited to a range of venues from house parties or restaurants to larger-scale rooms. Duration for these events may range from one to four hours. Consider the harp for your next special occasion.